Each year Aberdeen holds a Scottish wedding show with many exhibitors and top fashion names and brands coming from all parts of Scotland and the UK. Brides, grooms, bridesmaids, best men and proud parents will enjoy this special event and find the day useful and fun. 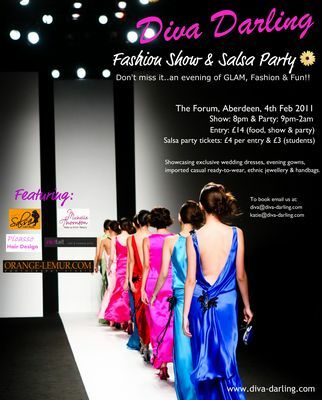 A wedding fashion show takes place on the 4 February 2011 at 7pm at The Forum in Aberdeen. This wedding fashion show event will feature the Diva Darling wedding and evening dresses collection and also showcase unique and exclusively imported casual wear from Europe and America. This Aberdeen wedding fashion show will also feature ethnic jewellery and handbags. The Diva Darling Fashion Show and Party promises to be a fun evening of food, drink and fashion that hopes to beat the winter blues. This Aberdeen wedding show will showcase the latest collections, beautiful made-to-order exclusive wedding dresses and evening wear. There will be areas where you can buy imported casual wear and ethnic jewellery and take a look at the Diva Darling new look books. Tickets to this special Aberdeen wedding show cost just �14 per person and includes a fabulous door gift for early birds, a delicious Asian buffet, a salsa party from 10pm hosted by Latinbeats.co.uk (additional cost of �4 or �3 for students) and a fantastic fashion show which will feature professional make-up artists, hairstylists from Picasso Hair Design Salon and a photographer who will be photographers Michelle Thornton and Nici Tait of Orange-Lemur Photography. During the wedding fashion show there will also be a prize draw with lots of lovely prizes. There will be a special discount price for those wanting to bring their friends and family along to this Aberdeen wedding show. For a group of five the ticket price to the Diva Darling wedding fashion show will be �60. Early booking is recommended for this wedding fashion show. For more information please visit the Diva Darling website at www.diva-darling.com and click on the coming up events page. Dedicated 2 Weddings Show will take place on Sunday 5 November.  There will be over 60 exhibitors taking place at the Aberdeen Hilton Treetops Hotel from 11am � 5pm. 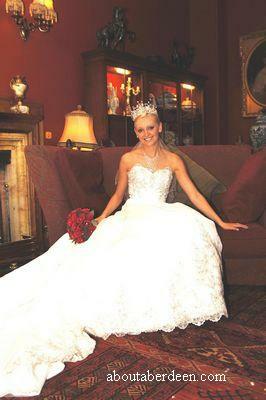 There will be two fashion shows featuring Aberdeen Ambassador and International Beauty Queen Miss Commonwealth Scotland, Amanda-Jane Taylor who will model her own spectacular wedding dress, following her wedding to Mark Slatter on 1 October 2006. 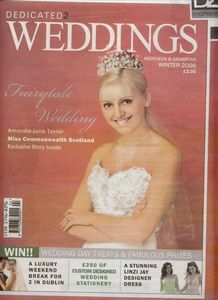 The bride show tickets cost �2 for Adults and �1 for concessions and you can pick up a free copy of Dedicated 2 Weddings magazine featuring the exclusive story of Miss Commonwealth Scotland�s Fairytale wedding. The Aberdeen Wedding Show was traditionally held at the Aberdeen Exhibition and Conference Centre (AECC) but since 2006 it has changed venue. Wedding anniversary dates and types of gifts to buy. Scottish Wedding Traditions and Customs.